The Pacman nebula, as NGC 281 is also called becaue of it’s shape, is special for me, as I stumbled upon it in an image I took of coment Hale Bopp in 1997. 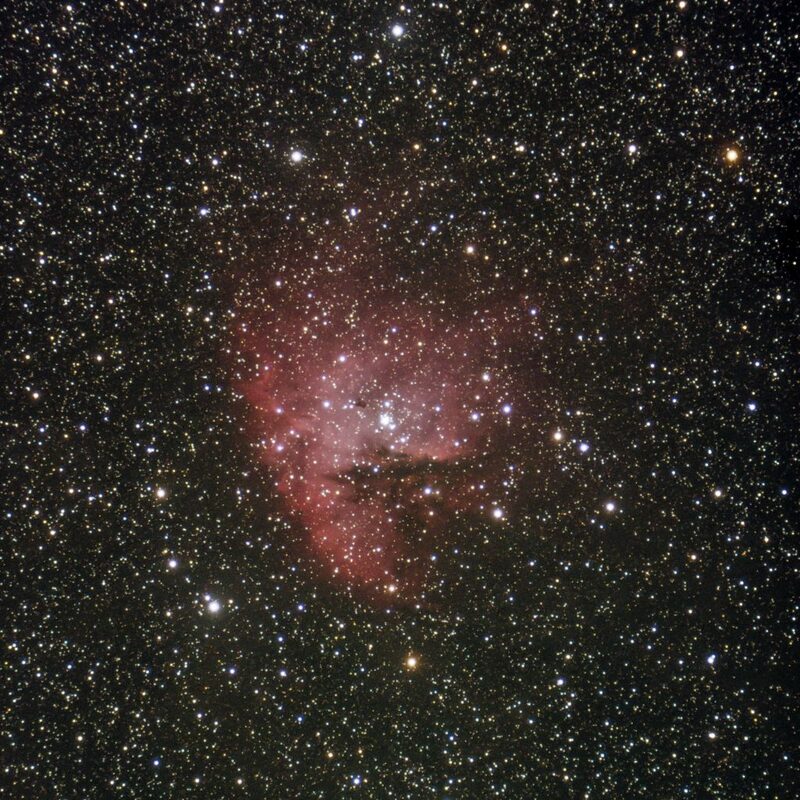 Since that time I wanted to make close-up image of this small emission nebula. NGC 281 – Emission nebula in Cassiopeia, 56x180s, Astro-Professional 80mm f/7 ED refractor, QHY163c cooled CMOS camera. Cropped. The nebula is created by bright young stars ionizing the gas in a molecular cloud, making it glow. It glows in the red light of excited Hydrogen. The brightest star in the center is believed the main source for the ionizing UV and X-Ray radiation. It is a luminous O6 star, belonging to the brightest and hottest (apart from white dwarfs) spectral class. Close up view of the nebula, showing the dark molecular globules silhouetted against the glowing hydrogen gas. 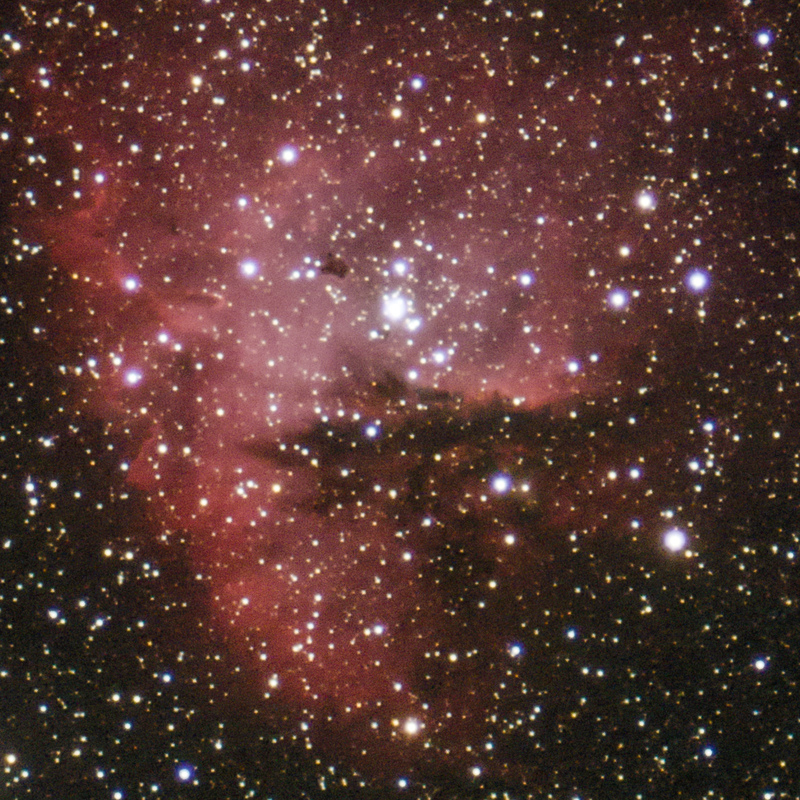 NGC 281 – Emission nebula in Cassiopeia, 56x180s, Astro-Professional 80mm f/7 ED refractor, QHY163c cooled CMOS camera. Crop of the nebula. NGC281 was discovered by Edward Emerson Barnard, a self-taught astronomer, who pioneered deep-sky astrophotography in the 19th century. At that time he was still working as a photography assistant in a studio. He was actually searching for comets, hoping he would get a financial reward. This entry was posted in astrophotography, deepsky.